Autumn Ridge Farm is a small stable so we can concentrate on taking excellent, customized care of each horse. Since the farm owners live at Autumn Ridge, horses can be kept in or turned out depending on weather conditions or other necessities. Turnout is based on the needs of the horse and its owner rather than on a rigid turnout schedule. 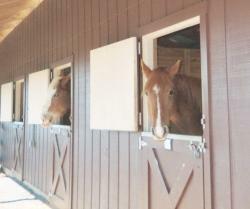 Horse care at Autumn Ridge Farm is provided by adults who are experienced at handling horses. This reduces risk of liability to you and assures that your horse will be handled in a responsible manner. Every horse is visually checked at least twice a day. 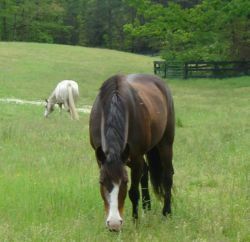 Mares and geldings are turned out separately, and horses are pastured in small groups. New horses are introduced to the herd gradually in order to minimize squabbles over dominance in the herd. Each day your horse receives up to 6 pounds of premium feed plus up to 20 pounds of hay or equivalent pasture. Autumn Ridge has a variety of feeds available and your horse is fed based on its individual needs. We feed only square bales so we can be absolutely sure of the contents of our hay. Of course, horses are given a constant supply of salt and fresh water, both in their stalls and in the pastures. At Autumn Ridge Farm we realize that you lead a busy life and that your time with your horse is precious. To help you, we provide many custom services at no additional charge. These include: blanketing and unblanketing, applying fly spray and masks, giving feed supplements, deworming every 60 days, and scheduling and holding your horse for appointments with the farrier, veterinarian, and equine dentist. With your permission, we perform minor first aid and apply topical medications. Each horse has a 12'x12' box stall. Some stalls have a small paddock attached. There is also a 12'x16' foaling stall with a paddock. All stalls are matted and well lit with both natural and artificial lighting. The stable is an English shedrow with two cupolas and is very well ventilated. Click on Facilities for further information about our stable. The monthly rate for a 12'x12' stall is $345.00. For a stall with a paddock the monthly rate is $355.00. Rates for the foaling stall vary. Discounts are available for owners boarding more than one horse.